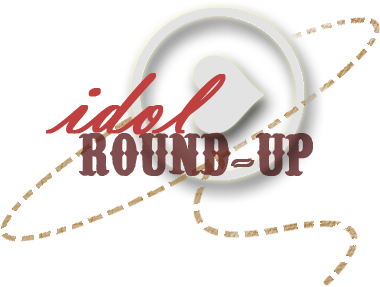 Time to take a spin around Idol genre and see what we can find. As you can see from this video they are an interesting group with a cute look. 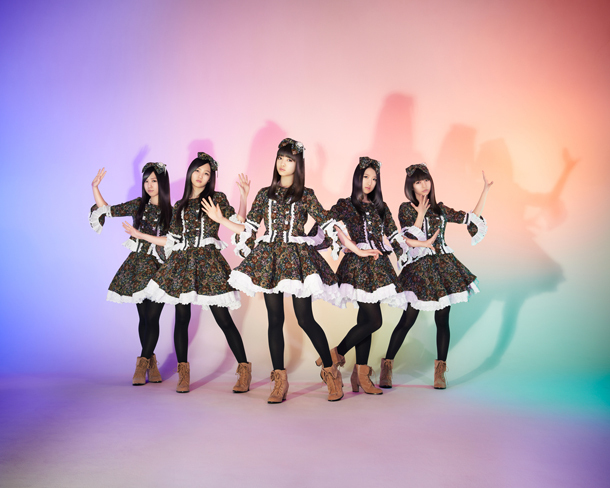 Cheeky Parade's debut single BUNBUN NINE9 has sold 23,522 copies! I'm so proud of the girls! After an awesome indie single, I really expected Cheeky Parade to come back strong with a good single, and they really reached my expectations. SUPER☆GiRLS has been in a slump lately (in song quality, bot sales), and if they don't step it up, Cheeky Parade could become iDOL Street's best group. Congratulations Cheeky Parade! Also, Shiritsu Ebisu's third single, Ume has sold 41,423 copies, landing third on the weekly oricon charts! This a huge jump from their last single, which sold around 20k. I think that ebichu is getting some attention, because momoclo has gotten really popular. I think that this is a good thing because I want them to be popular with the international fanbase, like momoclo is. They have so much talent and craziness. Let's hope they keep aiming higher! 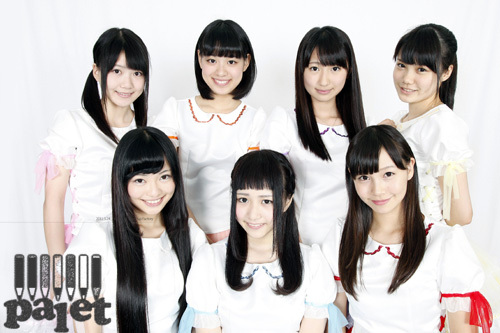 Palet, PASSPO☆'s sister group will be releasing their second mini album, SEVEN DESTINY. I haven't really seen any performances from then, except Mune no Button, which was off of their first mini album, Hello, Palet. It's scary how radically different Palet is from their sister group! Hopefully, the girls debut soon with a single of their own! 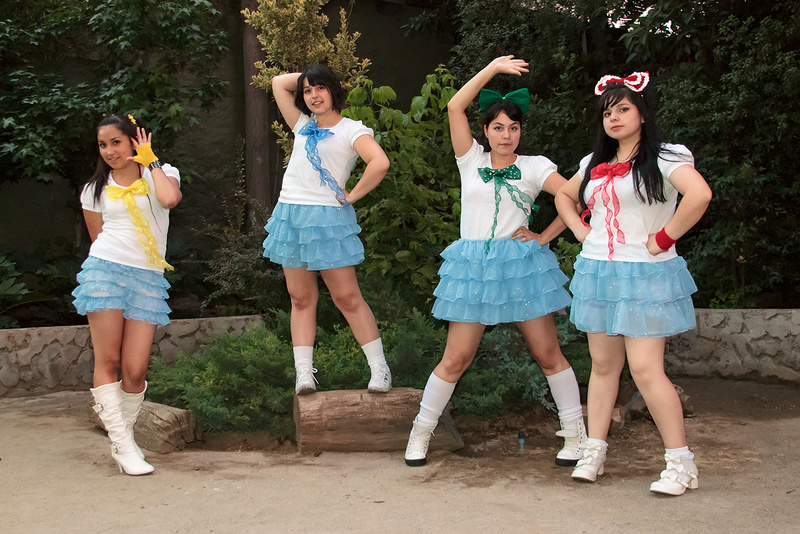 Recently I conducted an E-Mail interview with the J-Pop Inspired Chile cover group Battle no Jidai .This was an interesting interview as there was issues with language differences and Pure Idol Heart still learning about the group .However despite all the issues we somehow made it work . At the start I asked that one member of their choosing please give a brief history and talk about their CD campaign. Following that the members as best they could conducted the remaining interview. Because it is their words that have meaning ,I have left the interview the way they explained things. It may not all translate well in English , but it does give it extra charm points for trying. We are a "Battle no Jidai" group of four girls we do covers of Jpop Idols influences. 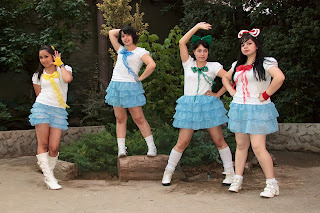 We are girls that we conquer hearts from the most remote in the world, we live far away from Japan, from South America in the city of Santiago of Chile., each one has mysterious powers, each represent colors and very entertaining features! How did Battle no Jidai start? Who came up with the name? 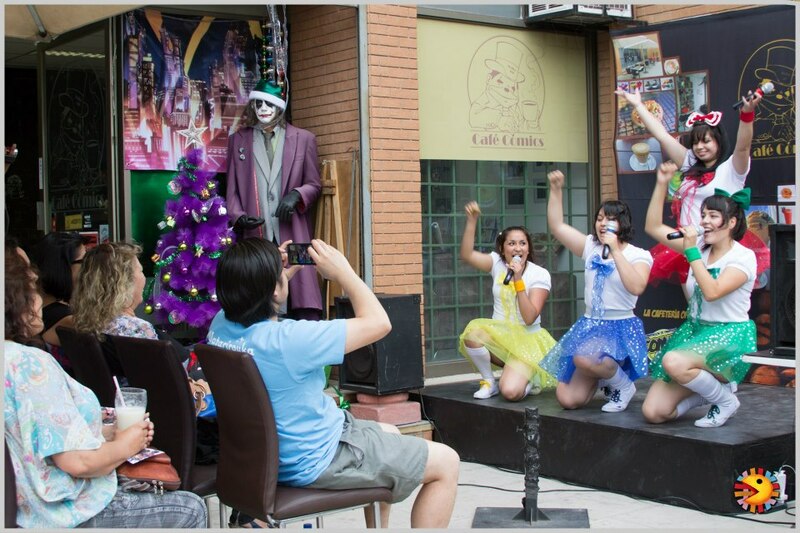 It all started at the beginning of 2012, there were four girls who we actively go in a group dance, but with the passage of time we wanted to perform singing also! To be a band with solid foundations and professional, we resort to a producer call EXP Chile, who helped us to achieve a concept and our great name "Warrior's day, artists at night!". Please tell us about your CD funding campaign? It is a website at the global level of financing collective calling Independiente, which focuses on music, art and education projects that focuses on LatinoAmerica as a pioneer project. Very popular in USA, Canada, Brazil, Mexico and Francia. About the CD, can you tell readers a little about the songs you will do for the CD? Yes, we will make a compilation of songs that we've played so far, we have a weakness with the groups indies and classics of the Jpop. But we will have Momoiro Clover, AKB48, Tanpopo, Watarirouka Hashiritai, Athena no Rokibetsu, versions soloists and adaptations by us to the Spanish. If your successful in your CD funding campaign, will fans be able to buy the CD if they do not live in Chile? 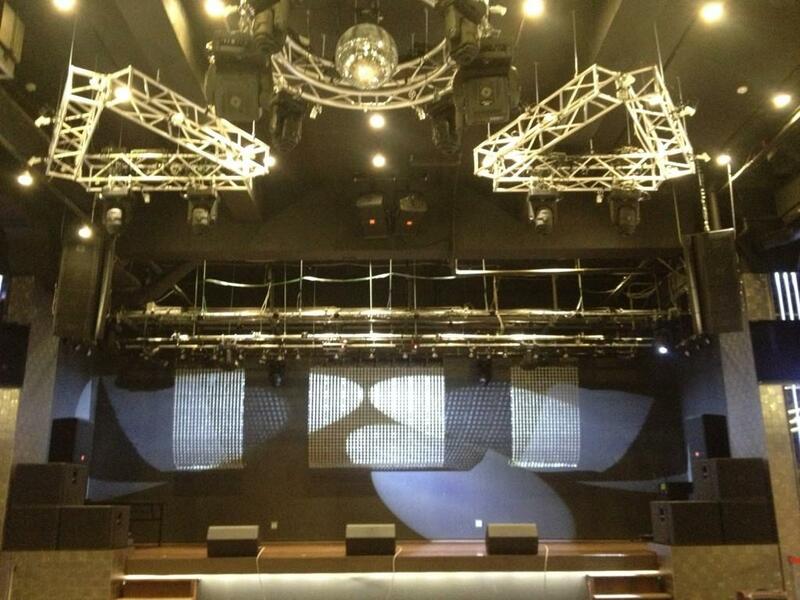 Although we can not reach to complete the financing we will fight by having the CD this 2013. As the CD will be digital, will be on sale through our page web via downloads online, so everyone can have it! Aiko: At first I got very nervous, but with each presentation we make me relax more and more while on the stage. I think that however you thrill me much do to the public interact more with us and make more wotagei! ChibiChan: Mmmm. ..me I put nervous and I touch me and I think about that I am going to mistake or was forgot me something! Maichan : I am very detailed, so I get very anxious a week before any event. My mission is to give much encouragement to girls so they are quiet and with much encouragement! On stage I'm another person! Reitan: Wow when I'm onstage I'm happy, I transformed and I forget everything, of course, that before uploading I'm almost dying in nerves... but stop being faced with the public makes everything that you forget me. How did you get interested in Japanese Idol Music? What Idol groups inspire you? Aiko: The music Idol interested me because turns out to be very positive and raises the spirit when one needs it. Many groups indie they inspire me since its effort is appreciated and its coolness in the setting, but the one that but defines is me Momoiro Clover! I believe their concerts and music they have defined a new generation of entertainment in the kind Idol. ChibiChan: The groups that I inspire is me in Momoiro Clover and Affilia Saga East, because happiness gives me and emotion, I knew the Jpop and the idols by the openings and endings to encourage, the first one was AKB48. Maichan: Since very small i have liked the Jpop, when I knew all the kinds, the one that has inspired me to be like I am is the music idol, is so clear in its messages, positive and gives me forces to continue listening it. I know many groups, but the ones that but I emphasize for my influence as the artist in BnoJ they are: AKB48, Dempagumi.inc, Tanpopo, Momoiro Clover Z and some groups Indies. Being an Idol group in Chile performing Japanese Idol songs, how have the crowd reactions been at your concerts? Aiko: Me do not I consider an Idol, neither I believe that deserve that title, but is amused to be able to have the opportunity to interpret themes Idol that fascinate me next to people as valuable as Mai, Chibi and Rei and of course EXP Productions. The best is that we have passed it very well. ChibiChan: At the beginning they think that alone we dance or that we double the songs or we are cosplayers, but is not thus, in the end them likes a lot and they dance next to we, i like! Maichan: I am very happy, always I have imposed me goals to comply and to be with the girls, as to be able to interpret and to adapt songs of my artists preferred is the best than I can have and to deliver. The idols alone can exist in Japan, but does not mean that we can transmit his music and the essence that we want to deliver! When we present us always I try to look at to the eyes and to deliver a great smile! With applauses or alone that look at the show, already I is a polite one! We want to diffuse the wotagei! Reitan: To the majority of the people charms them, is pretty to see all singing with nostras, and if not... smiling and after each show an applause is the reward... that does me very happy. In our greeting conversations, Battle no Jidai said that one of your goals was to spread your fan base to many countries. Have you been able to perform outside of Chile? Aiko: My dream is that they know us but in Mexico; for my represents a critical public and that knows a lot of the world Idol, therefore is a challenge for BnoJ. We expect of all ways the support of other Latin-American countries and I hope to be able to travel to many places and to diffuse the culture Idol and Wota. ChibiChan: If! I want to go to Mexico, Peru and to arrive some day to arrive at Japan next to the girls. Also diffuse the Jpop idol in every Chile and later to travel to nearby places. Maichan: I would like a lot of to be able to go to Argentina, Peru or Colombia. But a great dream is to go to Mexico, always I have seen that there is Wotas very impassioned and desirous of but groups covers of its artists preferred, as also to go with every BnoJ to sing to Akihabara! We will try to negotiate some Tour and also to continue travelling by every Chile. Reitan: Serious magnificent to go out of Chile and that all to know what we do... so if we have the opportunity we will go where be! hahahaha! Aiko: Improving my quality in dance, to succeed in which propose me and to deliver all the spirit and passion next to Battle not Jidai! ChibiChan: Heeem, many trials, presentations and events! Having but you brought and to perfect us but as group. Maichan: Being very successful and professional! It is very difficult what we carry out, all have university careers and works that to fight. We want to achieve a Cd and suits each time but beautiful! Reitan: The idea is to record our digital CD, and to improve in every environment to present a better show each time. Closing comments from the group. We want to thank to all for its support and comprehension, lacks us a lot by learning! I am not one who really likes to write about my life ,while my friends say that I should be proud of things that take place in it and with my daughter’s music careers and be more open. For some time now my two daughters have been preparing for their music career debuts ,something that is important to me to see them follow my career path. This made me think of how they can one day be someone`s oshimen. Well that`s not completely right as the oldest is entering rock music ,while the younger is walking the Idol group road ,so I guess really one can be an oshimen. While both are on different roads of Independent music ,it`s the oshimen road in Independents that I want to discuss. I have made it no secret that when it comes to Idol genre or music in general ,I love supporting Independent small known groups, it`s just something special about these little known ,a challenge to follow groups that make makes them more exciting to me. When I think about how my youngest could now become someone`s oshimen ,I end up thinking about the whole Idol-wota dynamic ,and how fans will be buying her merchandise and collecting Idol memories. You know ,to this day I still remember the smiling face that was Okada Yukiko more than I do that tragic last day of her life. That is the memory I hold on to. If Idol fans are memory collectors , then surely that makes oshimen ,Idols the memory creators, yet it is much deeper than that in many ways. The road to fame for Independent artists can often be difficult , if you were not successful first and then decided to go back to your Independent roots. One only has to look at this recent show with Steamgirls to see the road can have many difficulties along the way. Yet you can`t judge every group by this example or the reasons they face difficulties by it. When you’re supporting a group such as Steamgirls or any Independent ,the system is designed so that you feel that you’re directly helping their success. You’re asked at the door which group your tickets is for , after lives the groups sell their merchandise themselves ,not some merchandise company or agency staffers as the Idols leave the arena by some backdoor. So you’re buying CDs ,shirts ,towels and so on from the members you support, from their own hands ,allowing you to create better friendships, while respecting that magical border between Idol and fan. Your voice , your actions have meaning to these groups. The Idols become our little or in some cases big sisters . Independent Idols and fans are banded together like rampaging armies for Idol microstates moving from venue to venue in a meaningful ballet march as one .With our Idols leading the way ,the memories they create that night and the memories we collect are treasures to claim at journeys end. Every Idol microstate has its own story to tell and its own tribe of followers and in some ways that hurts the overall growth of Independents as a genre, but that is a story for another time. I don`t know the outcome of the road that my daughters will take on their music careers or anyone`s daughter entering music . Both are talented and whatever their career results, their experiences will be something special to both of them and the fans that decide to support them. How do I know that ? well it`s simple , where there are oshimen and Idols the memory creators ,there will be the fans ,the battle scarred knights collecting those memories ,until the final curtain call, and there is no more memories to create. Kikkawa Yuu has released the videos for her seventh single on YouTube. Kikka's seventh single is a triple a-side: Chocolate Damashii/ Sekaijuu ni Kimi wa Hitori Dake/ Valentine's RADIO. The single will be released January 16. Chocolate Damashii is a cover song of Matsuura Aya. I haven't actually heard the original song yet, despite being an ayaya fan. Chocolate Damashii is more upbeat. As all Ayaya songs are, It's really catchy! Kikka does a good job covering it. The PV is beautiful! Kikka looks mature and classy. This is my second favorite song. Valentine's RADIO is originally by Matsutoya Yumi. I also have not heard the original song. Valentine's RADIO is also my favorite song out of the three. It's such a soft sounding song, and it's very catchy. Kikka's voice sounds lovely. The PV is very creative, and cute. It features Kikka as an andriod made, who is trying to make Chocolate. Sekaijuu ni Kimi wa Hitori Dake is the only original song. It's a slow, love song. Kikka's voice has a slight auto tune tone to it, but it's not too bad. The PV is very beautiful. It features a lovely outdoor scene, Kikka's outfit is really cute. The PV is nice, but the song will have to grow on me. Palet has released part two of their new program. You remember this program ,the one where they are in the kitchen ,yet not a single food item has been cooked. In my introduction post ,there was not enough room for all the videos .As Mind Pierce follows Pure Idol Heart Twitter and ended up retweeting the first post we made of them and readership was good ,we have decided to do a follow up and add more of the live show. Previews for some songs off of Tokyo Girls' Style 3rd album, Yakusoku have been released on YouTube. Futarikiri is a catchy upbeat song, Suki to Sayonara is more slow and has an interesting instrumental, and Yakusoku is very interesting, and unique. All of the songs make me really excited for the album. Release date is January 30. 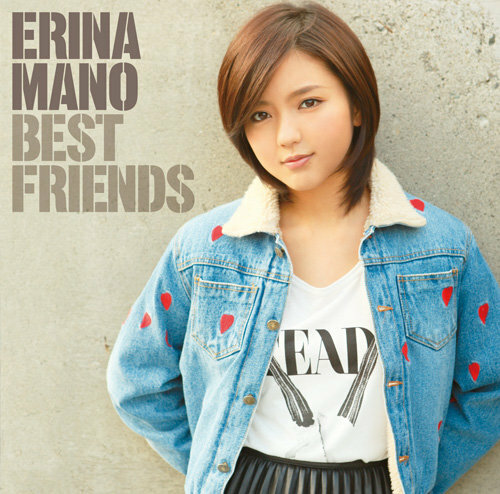 Also, Mano Erina has released the track list for her last album, Best Friends. Best Friends is a best of album that features many old favorites, plus a new songs. The covers are simple, and Mano looks mature. I'm late, especially for a group I love, and follow, but PASSPO☆ has released the PV for their 7th single Sakura Komachi. Sakura Komachi means cherry blossom town, and it follows the popular idol trend of having "sakura" in the name. The b-sides are NO. 1 Boy, and Wish on a Star. PASSPO stated that this single is supposed to be a sad love song, and I agree! Next to their thrid single, Kimi wa Boku wo Suki ni naru, this is as idol-ish as PASSPO☆ has ever gotten. But I don't really mind because Sakura Komachi isn't bad at all! The beginning of the song features a really cute instrumental, then the rest of the instrumental reminds me of an AKB song. The chorus is catchy. And whats amazing about this song is that even though it is idol music, it still contains some classic PASSPO☆ rock. The PV is beautiful. I like how, instead of the classic pink/white, PASSPO☆ went sort of original and did a blue theme instead. All of the girls look so pretty and lovely. Sakura Komachi is a nice, and simple PV, and it really stands out amongst all of the idol graduation songs. Will be released February 13! Sometimes it pays off to have nearly 100 Indie Idols following you on twitter as they pass around groups that you might want to look into. Mind Pierce was one of those groups that came across my desk as a group to check out and I did. Their web site is funny in a way as immediately you notice the name spelled as Mind Pirece ,yet their own schedule it`s listed as Mind Pierce . Mind Pierce is a new face Idol duo Yukari and Nagisa who describe themselves as Rock`n Idol . Like all Indie Idols there is a lot to like and a lot of potential to grow stronger. Here is Mind Pierce in action in a typical live house, with so-so quality sound quality.